FLORASCENT Room Fragrance - Siena - includes 5 rattan sticks. A fragrance as fresh as a citrus grove in Tuscany. Crisp, fresh citrus notes combine with mandarin blossom and aromatic basil. Not tested on animals. An exquisite collection of precious natural organic perfumes. A combination of pure flower essences and aromatic waters to create a captivating scent composition. Precious, organic raw materials produce unique scents, which are hand-bottled, hand-sealed and packed in unique handmade paper containers. The FLORASCENT brand is committed to ensuring it is a natural brand and the products contain exclusively herbal components. The perfume line comes up smelling of roses in declaring ever natural ingredient and component used. FLORASCENT has the scent of success, not just as a fragrance choice, but a fragrance choice that you can reply on for clearly stated natural ingredients. Contains: 1 room fragrance 250ml bottle and 5 rattan sticks. To use the room fragrance remove the bottle cap and stick the rattan sticks into the bottle. Then the rattan sticks stand upright in the bottle like a bouquet and unfold the fragrance in the room. You can determine the intensity of the fragrance by adjusting the number of sticks in the bottle. Below are reviews of FLORASCENT Room Fragrance - Siena - 250ml by bodykind customers. If you have tried this product we'd love to hear what you think so please leave a review. 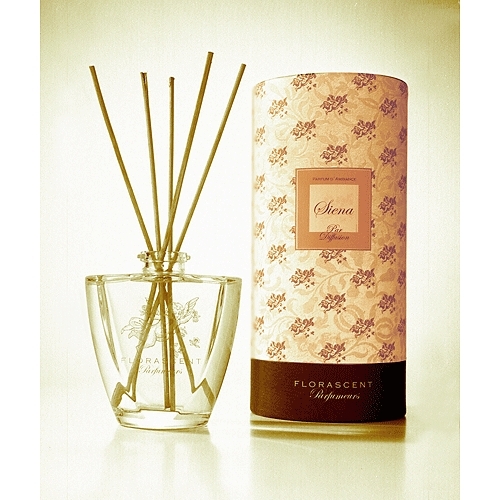 FLORASCENT Room Fragrance - Siena - includes 5 rattan sticks. This reed diffuser has a fragrance as fresh as a citrus grove in Tuscany. Crisp, fresh citrus notes combine with mandarin blossom and aromatic basil.